Weird Exoplanet Discovered by TESS Spacecraft — Strange World, Indeed! Astronomers using the Transiting Exoplanet Survey Satellite (TESS) announced the discovery of a strange exoplanet orbiting a star 53 light years from Earth, marking the third major discovery from this revolutionary new instrument. This newly-discovered exoplanet is roughly three times larger than the Earth, but 23 times as massive as our home world. Named HD 2172b, this alien world orbits around its parent star every 36 days, the longest period of any exoplanet yet found by TESS. The star around which this world circles is about the same size as the Sun, and is nearly as luminous as our parent star. Just like our own solar system, planets closer to that star revolve more quickly than bodies further away. Despite the close proximity to its parent star, astronomers estimate the surface of HD 2172b has an average temperature of just 150 degrees Celsius (300 Fahrenheit). “It’s the coolest small planet that we know of around a star this bright. We know a lot about atmospheres of hot planets, but because it’s very hard to find small planets that orbit farther from their stars, and are therefore cooler, we haven’t been able to learn much about these smaller, cooler planets. But here we were lucky, and caught this one, and can now study it in more detail,” said Diana Dragomir, from MIT’s Kavli Institute for Astrophysics and Space Research. The mass and diameter of HD 2172b confirms a density about the same as water, suggesting this exoplanet could be surrounded by thick gas, more dense than that encompassing Uranus or Neptune. 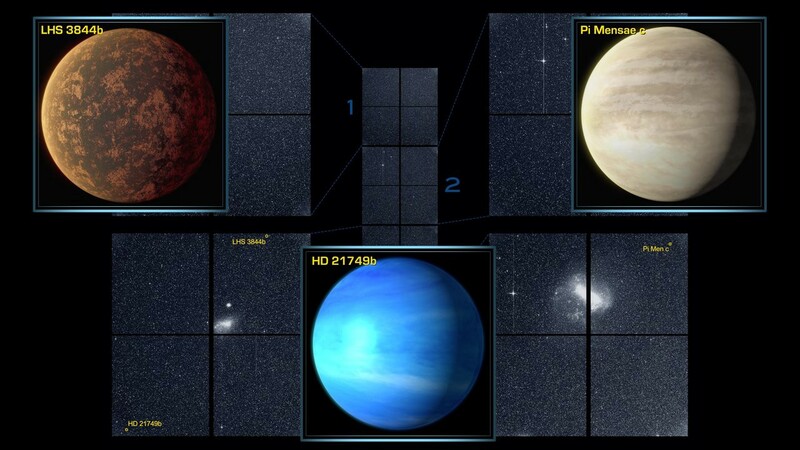 The two other planets found so far using TESS include LHS 3844b, which completes an orbit around its star once every 11 earth days, and Pi Mensae c, a super-Earth with a year just 6.3 days long. The exoplanet LHS 3844b is only about 30 percent larger than the Earth, and is found 49 light years from our home world. Further away, 60 light years from the Sun, Pi Mensae c is twice the size of the Earth, orbiting a star much like the Sun. Another possible planet found in the HD 2172 system appears to be approximately the same size as the Earth, making one orbit around the star every 7.8 days. Astronomers have yet to confirm that finding, which would be the smallest world yet discovered by TESS. 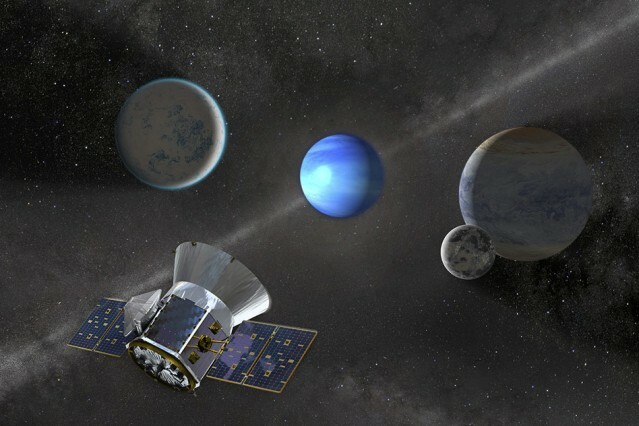 Since its launch in April 2018, TESS has discovered over 280 potential exoplanets surrounding alien stars. These findings come from observing dips of light from stars, which can be associated with planets orbiting in a direction which places them between a star and the Earth. The satellite observes one sector of the sky at a time for 27 days, before moving on to the next area for study. Ground-based observatories are currently following up on that data, in an effort to confirm or refute the findings. When all the work is completed, researchers using the TESS observatory will have examined 85 percent of the sky in the search for exoplanets to add to the 2,600 worlds discovered through data obtained by the Kepler spacecraft. In addition to finding exoplanets, the TESS spacecraft is ideally suited for discovering supernovae — titanic explosions created by stars. These come in three forms — the collision of two white dwarfs (small, compact stars), by material falling from a massive star onto a partner in a binary system, or the explosion of a massive star in the throes of death. Already, TESS found six supernovae before they were detected on Earth, as many as Kepler discovered in four years of operation.